Payton has had several sessions of private speech therapy now. She is warming up to the therapist and I actually am starting to like the "medical model" ... despite the inconvenience of it all. The therapist has done a lot of bubbles with Payton, which she loves. Payton already says her version of "bubbles", which sounds like "bub-ba". And we are trying to get her to say "pop" ... as in pop the bubbles. Get it? Haha. She has been working with her also a little bit on colors, prepositions (in, on, under, etc), animal sounds and counting 1, 2, 3. Because yes, she is three and she doesn't really know these things. Which makes me so bummed. So we are on a mission. Here are some color buckets I made for at home. She can easily match the colors, but the key here is to get her to say or sign the color too. Umm ... I guess I need to learn the signs. So much to do, so little time. Sounds like she is making great progress- go Payton!! so our special ed, told us that he knew the colors BUT he couldnt express it. he could match it, but when asked he always said azul. so it was a speech thing, and we didnt bother much since we knew he knew it, just he needed to get better with speech. now he says : 'amayiyo' (yellow) or 'dede' (green) or 'dojo' (red) . Oh and the 1.2.3 was easy for him to learn since he loves to run, and we play a lot races. forgot to mention that we did also the buckets you made, but we did in boxes. but the recommendation was to work with one color at time. so one week was yellow, and also we used a lot of yellow in clothes, and we played with yellow balls, and yellow balloons, and chew yellow gums, and ate yellow jello and play in the yellow swing and stuf like that. so we could easy say all day long the word yellow. See if your local library has Signing Time videos. That is how The Love Magnet learned her colors, counting, and alphabet. She learned to sign quickly. Speech came later....but it did come. Found your blog linked from Sarah's (Class of 2008). I feel you! Payton is as always Adorable! Best of luck with speech! I love the "medical model" too. It is more effort on your part but it's worth it. 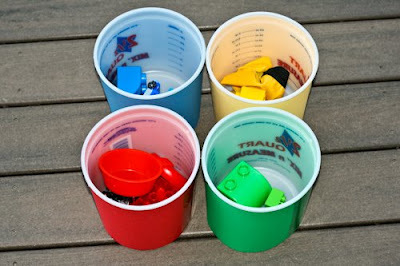 I like the color buckets- I think I will copy your idea. Lila has absolutely no interest in matching colors. Ummm she looks way to old in that picture, it can't be Chicky!!! :) Oh and since you're making color cups can you make some for me and send them my way! Ok good, love ya tons!!! We are (hopefully!) starting private ST soon as well. And we are right at the same spot with colors. It was one of those things where I was thinking she might be talking before I had to teach her colors and try to learn those signs. Oops! Bethy - is the delay common with most DS kids or is behind DS kids for her age too? "do you know the colors of the rainbow, do you know the colors of the rainbow". Signing Times can teach them to you...:) I think it's dvd #6. We just started that one a few weeks ago. Love the buckets. What a great idea! Yay Payton!! She's doing so well! Vitamin K Deficiency. Oh, and Juicing. One day with no doctors, please? Bloodwork. Sickness. And ramblings from the Mama.